The following is a list of eight books that I plan to read this spring. This will be my season to catch up on what I've been meaning to read. A spring cleaning, if you will. Three of them are new selections, but the rest are what I didn't read (read, finish, or reread) from my Winter 2015-2016 Reading List and even from Fall 2015! One pick is actually an extra book (as in not previously listed) that I started early last winter but never finished and want to make a point to do so. I shall have a summer list made exclusively of new selections. Please send me recommendations for my time between Memorial Day and Labor Day! 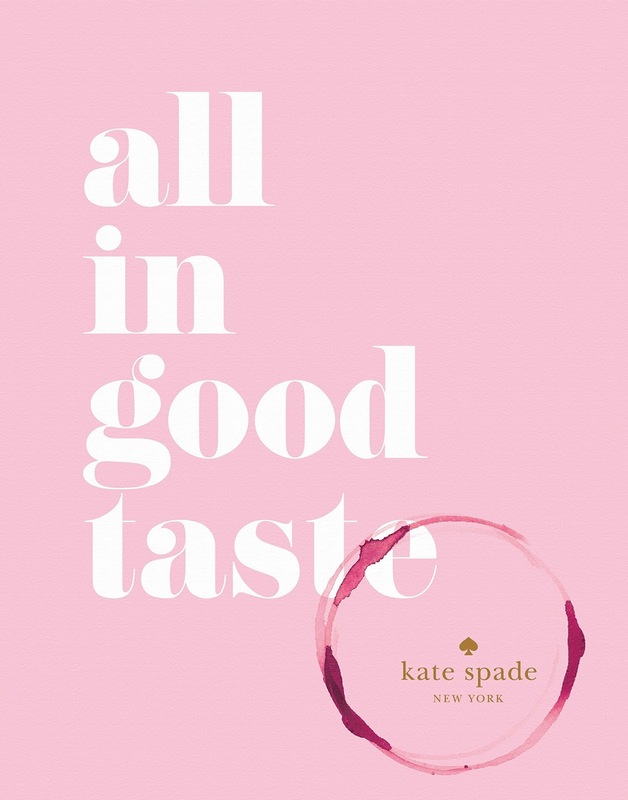 I was hesitant to purchase all in good taste by Kate Spade New York, fearful that I would spend the money but wouldn't learn anything new about entertaining. But, I didn't need to! 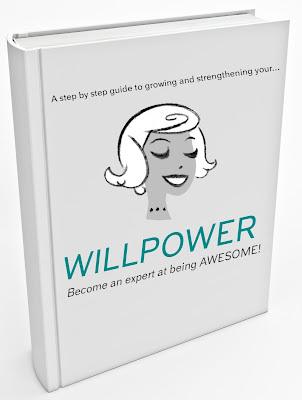 Flipping through it, I skimmed a lot of good tips. So much fun! I can't wait to read it cover to cover! I think I'll start it today. 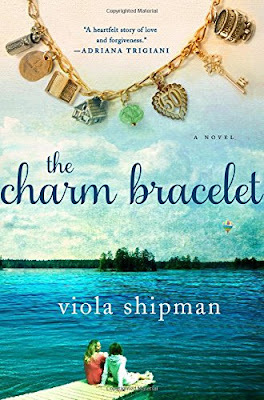 I look forward to picking up my hold of The Charm Bracelet by Viola Shipman at the library soon. 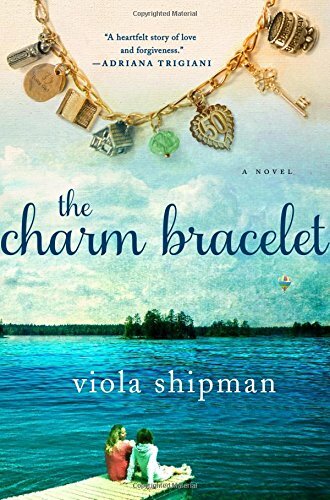 This new novel focuses upon three women who reconnect over the charms and their associated stories. 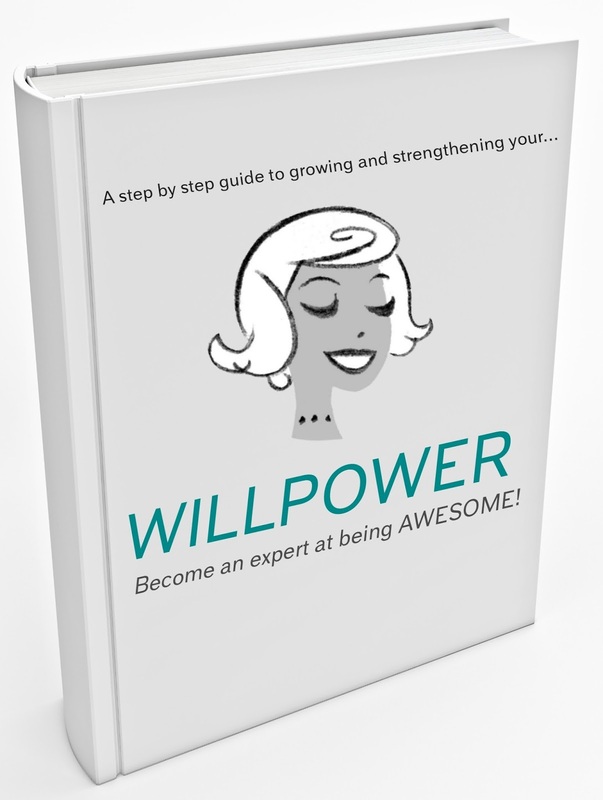 I follow the blog The Glamorous Housewife and so Bethany Herwegh's ebook Willpower: Become an expert at being AWESOME piqued my interest. The 30 chapters are intended to be read over 30 days, so I figured why not? for April. You can learn more about it by signing up for the blog's newsletter. 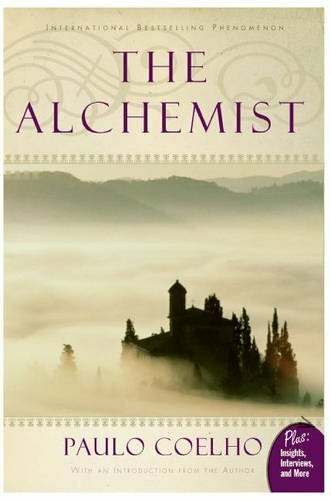 Listed on my Winter 2015-2016 Reading List, I still haven't checked The Alchemist by Paulo Coelho out of the library yet. The main character Santiago is a shepherd who goes on a quest for treasure in the Egyptian pyramids. It's about discovering one's destiny and may even be life-changing for the reader. 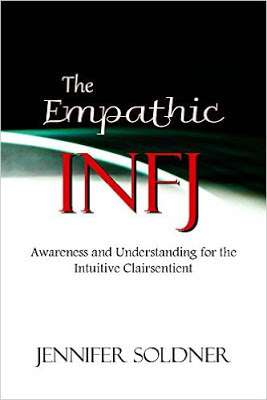 From my winter list, I bought the Kindle version of The Empathetic INFJ by Jennifer Soldner and did start reading it, but didn't finish. 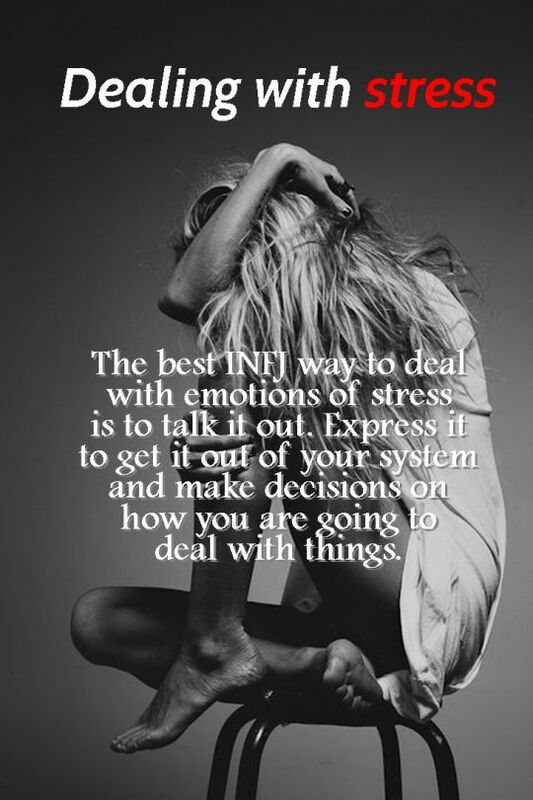 I read about the INFJ personality type online a lot and this book explores a particular topic. Yes, this book again. 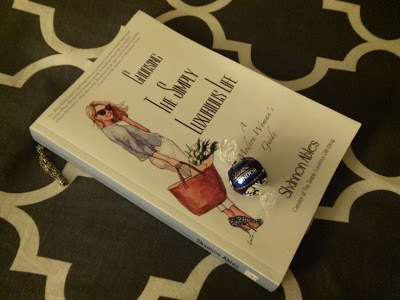 I have actually read Choosing The Simply Luxurious Life: A Modern Woman's Guide by Shannon Ables of the blog The Simply Luxurious Life, but wanted to reread my copy last summer, fall and winter in order to take notes and draft a review. I bought this book from my fall list, but haven't managed to read it either. 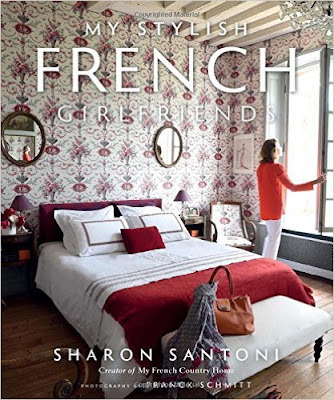 After reading and looking at the pretty pictures of My Stylish French Girlfriends by Sharon Santoni, I will place this coffee table book in my small stack of style books topping my bookshelf. I started The Only Street in Paris: Life on the Rue des Martyrs by Elaine Sciolino at the beginning of winter but my Kindle says that I'm only about halfway through. Yes, it is a whole book about a single street. 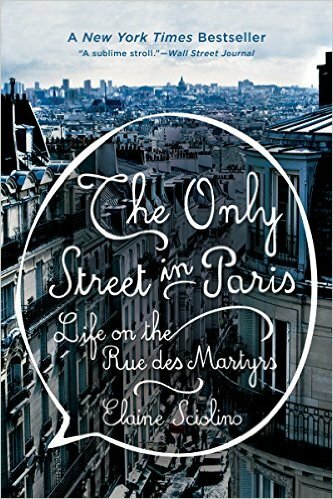 It'll be nice to spend my birthday month in Paris again, if only vicariously through the passionate author this time. This is my 100th post in the Simple Pleasure Sunday series! I love this regular feature for my lifestyle blog. How it demonstrates the concept of elevating the everyday. 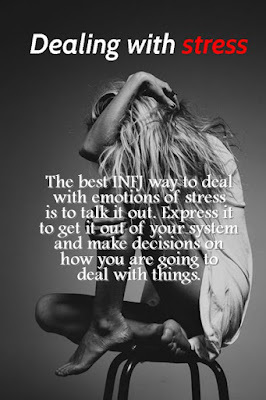 I feel it is an important topic to discuss as one can easily just go through the motions of his or her day-to-day life. Hours, days, weeks, months, and so on can feel like they're going too fast. 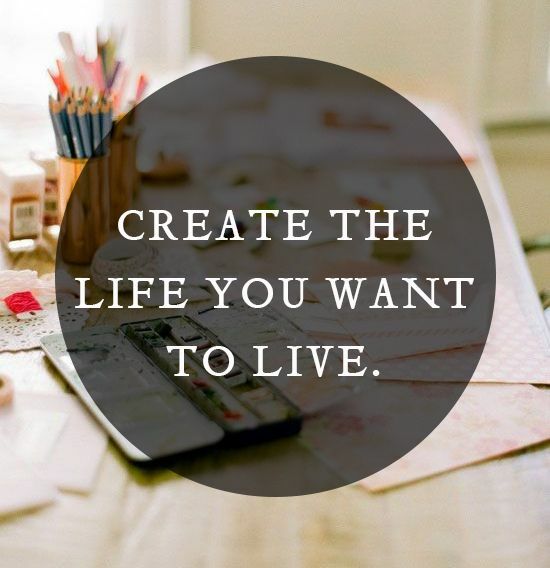 But life is too short for that! Work and to do lists are important, sure, but so is balance. Life should be full of beautiful moments. You can seek pleasure and happiness by savoring the little things in life. You can slow down and use your senses to appreciate something you adore. 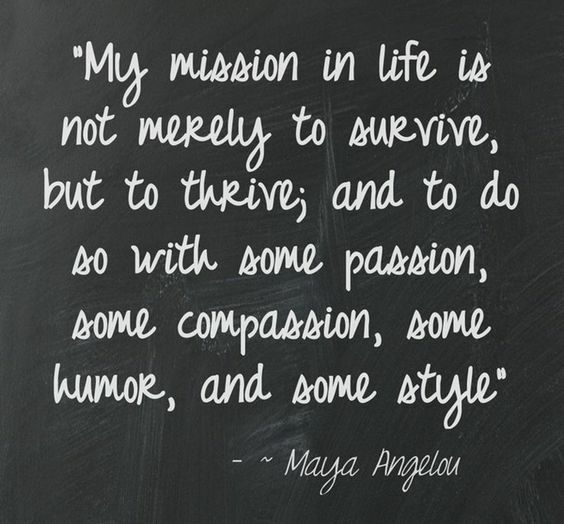 For a moment, you can make a conscious decision to live intentionally and fully. If I can do it weekly on my budget, then anyone can! 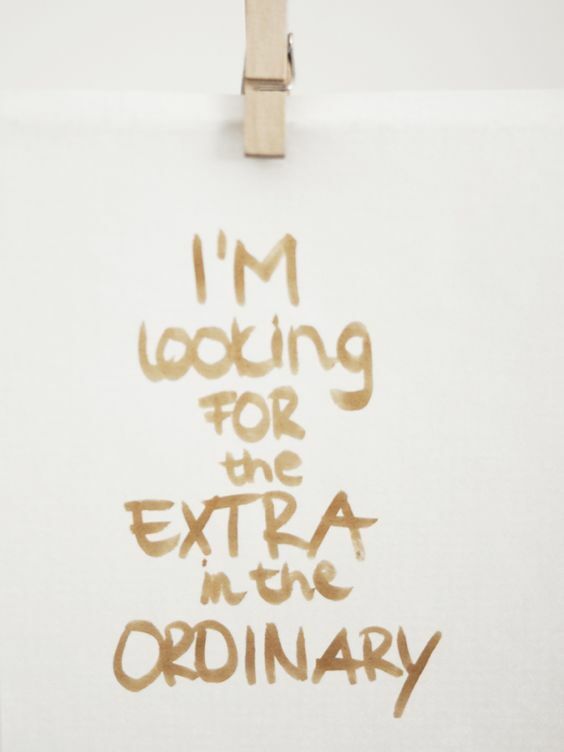 Especially since these are not big events or purchases but everyday pleasures. They can be found everywhere. 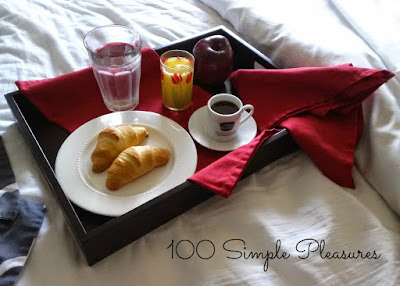 I have listed links to all my simple pleasures published so far. 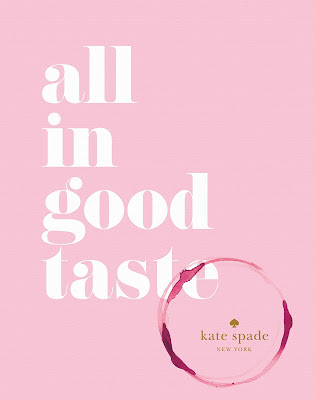 It is my hope that you will indulge in a little luxury. A lot of my readers are reveling in simple pleasures already. I enjoy reading comments on this kind of blog post. It makes me smile whenever I inspire someone to try something new or redo something that he or she hasn't done in years or even learn that a reader loves the item or experience too. Her latest work of historical fiction, At the Edge of the Orchard, was just released the Tuesday before last. I started reading last Sunday night and stayed up late to finish it Wednesday night. This selection from my Winter Reading List was good. What I like about the author is how vividly she depicts a moment in history. Plus, she heavily researches a subject that the protagonists are passionate about or the main subject matter of the novel, which truly enriches the story. Usually, it's some kind of art or craft. This time, it was apple trees. I picked up the hardcover at the library. The book is about the Goodenough family, American pioneers who venture west during the 19th century. They literally get stuck in the mud in a place known as the Black Swamp in Ohio and decide to settle there. Apparently, there was a law to plant 50 apple trees in a certain amount of time. This acts to clear the land. Johnny Appleseed was a real life figure who traveled the area selling this particular tree. The Goodenoughs are a dysfunctional family, although passionate about apple trees, albeit in different ways! One character only likes them for the alcohol you can make called applejack and to use them as pawns in order to create drama within the family! Frontier life was hard. This is a tale of survival. While depressing, it was also captivating because the character development was so strong and the writing so vivid. You want to see how it all turns out! 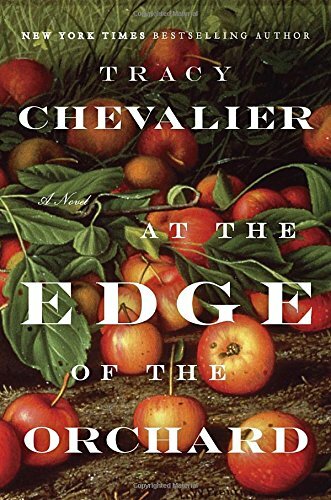 If you have read Tracy Chevalier before, have an interest in this particular period of American history, or simply want to be enthralled by a fantastic work of fiction, then I recommend this book. Whenever I enter the Reading Terminal Market in Philadelphia, I first pass by the windows of a kitchen where they make the chocolates on-site for Mueller's. Chocoholic that I am, it at least slows me down every time! A delight from that start! Set in the windows, they feature molded chocolate of odd things like a human organ or a tower of stacked chocolate covered treats! Catty-corner stands their long display cases filled with chocolates and other confections. 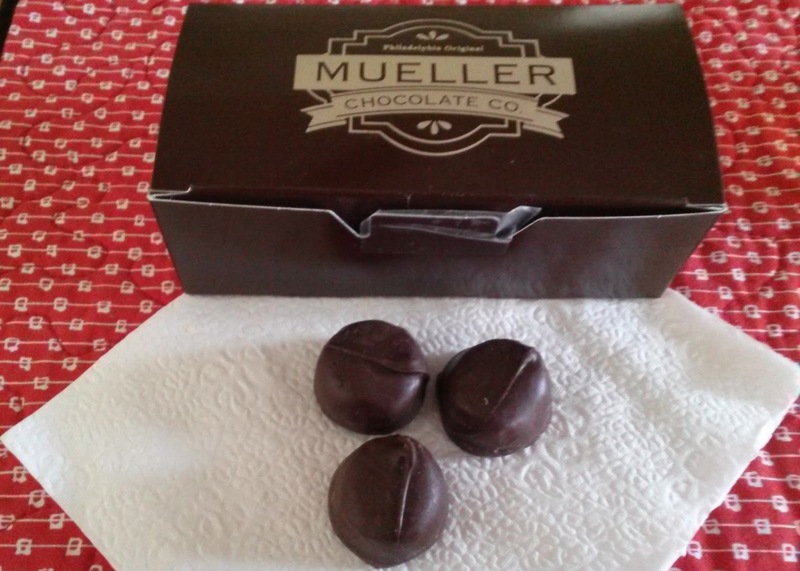 My sister, who also lived in Pennsylvania for a short period, is a fan of Mueller's. She happens to be a truly fabulous gift-giver and last Christmas, she gave me a box of chocolate creams. 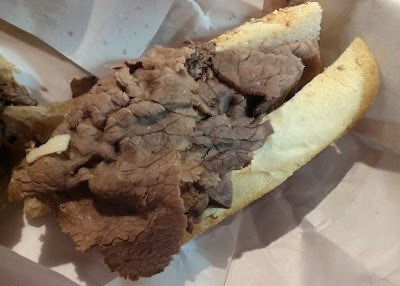 On my last trip to Philly, I wanted more! I took a number but since it was incredibly crowded, couldn't really move from my spot in front of the cases. Their inventory is truly vast. When it was my turn, I ordered 1/2 pound of dark chocolate creams, which resembled what my sister had given to me, plus 1/4 pound of dark chocolate vanilla butter creams. Eating my way through the city, I didn't happen to sample any on my trip. Both of my choices were decadent and delicious, just not my favorite chocolates ever. I would choose a dark chocolate Lindor ball over them. I think the consistency of the center was just a bit too liquidy for my taste. I wished it was just a bit more firm. Plus, you eat with your eyes first and these were simply not polished and pretty. Maybe I just need to order something else... Like I said, it was so busy that I couldn't see much of their remarkable selection. I certainly do not regret the purchase however. I enjoy patronizing small businesses. 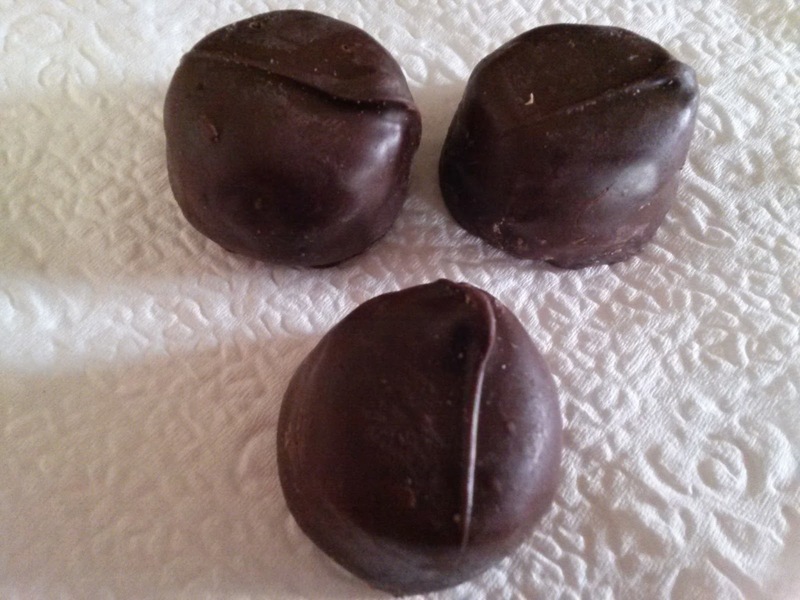 I savored all of the dark chocolate creams over the following week, one or two for dessert after a lunch or dinner. It was a small treat to look forward to. I did sample the vanilla variety and enjoyed them, but wanting to lose some weight before my birthday, I actually gave the majority of them to my co-workers who adore chocolate as well. I do look forward to returning and trying out other things, the prettier round truffles included, especially if I have a run of the entire glass case! I visited Philadelphia, a city I love, the Sunday before last. It was a quick trip as I didn't want to be there a long while and tempted to spend more money. I took the train to 30th Street Station. While there, I grabbed a cappuccino and chocolate croissant from Au Bon Pain, both of which were delicious. 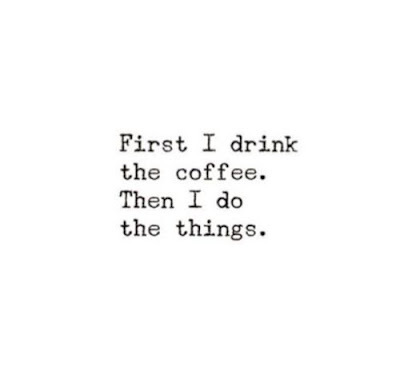 Unable to sleep much the night before, I definitely needed some more caffeine. I'm sure the sugar helped a bit too. Cranberry Pistachio Biscotti from Termini Bros.
Next, I bought dark chocolate creams and dark chocolate covered vanilla butter creams from Mueller's right across the aisle. These are good, but simply not my favorite chocolates. I still savored all the chocolate ones throughout the week. I did sample a few of the butter creams, but gave most to my three co-workers who were delighted. I walked around the market next, which was difficult since it was so crowded! The burger stand was closed as some are on Sundays. In Philly, go to the cheesesteak place with the longest line; it's so worth it. That would be DiNic's, famous for its roast pork sandwich as well. I took my place at the end, which was all the way around the stand's counter and continued plenty down the aisle, but, luckily, the line moved quickly. I ordered two plain roast beef sandwiches and a coke. One sub was for my sister who was incredibly happy with it that evening when we were at my parents' place, me doing my laundry. Anyway, I finally found a bar height table to stand at in order to eat. This sandwich is remarkable. The beef has some sort of Italian seasoning. I could only finish half there and had the other half for dinner the next (Monday) evening. It was still amazing! 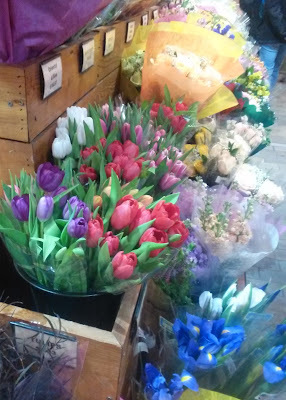 On the way to dessert, I snapped this photo of the stunningly beautiful flower stand... I love tulips! Market Blooms inside the Reading Terminal Market. 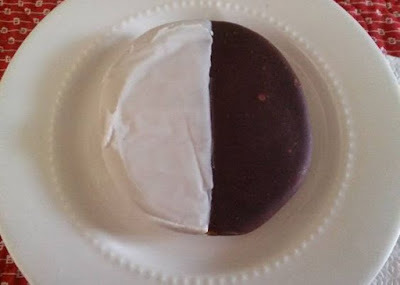 Then, I bought four cookies from Famous 4th Street Cookie Company, two chocolate chip which are my favorite plus two black and white which I thought were cosmopolitan, although more New York than Philadelphia... I just wanted to try something a little different. I enjoyed one of the chocolate chip cookies while waiting for my train at the station. 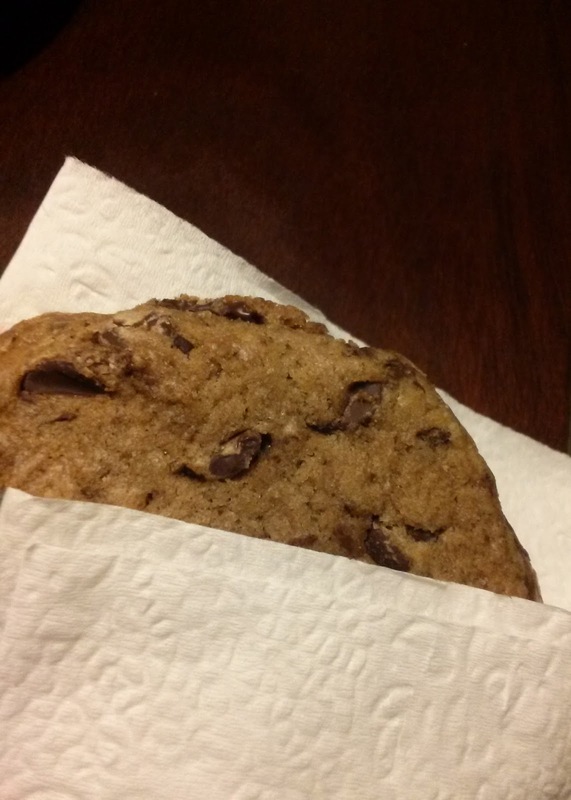 Despite the cold weather, the chocolate chips were still gooey, so good! I enjoyed the rest of the cookies over the next week. I emerged from the busy market and walked in the direction of where I remembered a nearby West Elm would be. I was a tiny bit lost, so I googled the store on my phone really quick and got the address. I quickly found it after that. I bought this 12" Square Lacquer Tray in Metallic Silver to go on top of my bookcase bar. It holds my ice bucket, shaker, jigger, handheld citrus juicer and stack of four coasters nicely. (I'll post a photo in a future blog post.) It was convenient to load all of my food bags into the large sturdy shopping bag. After that, I strolled down Chestnut and then walked up Walnut, which is a nice shopping district. The sun was shining and I was smiling, happy to be in a city I adore. 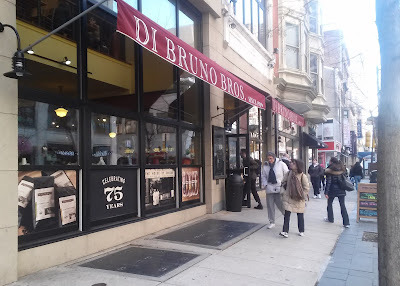 On Chestnut, I walked around Di Bruno Bros., the Italian grocery store, cheese shop, and cafe. Their prepared foods look incredible. I wish I could have a shopping spree there, but unfortunately everything is on the expensive side. 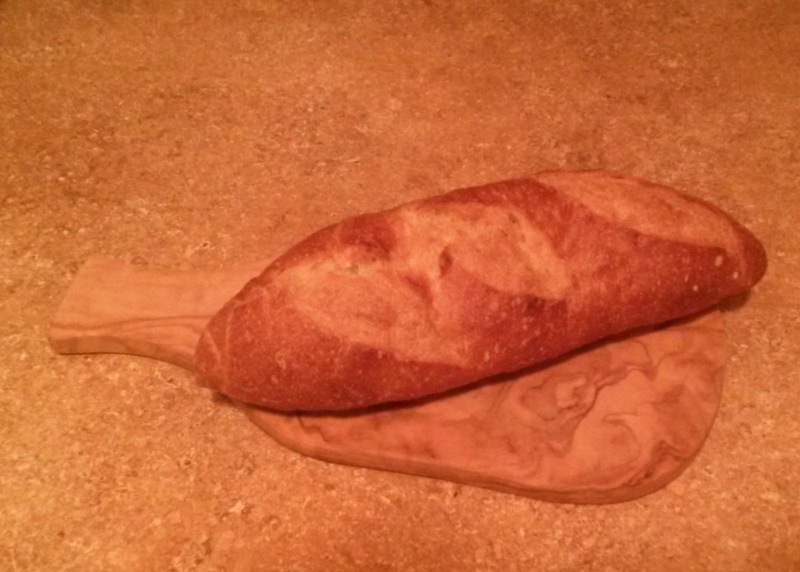 I love bread and they sold demi baguettes for like $1.50, so I picked up one of those. Accompanying my pasta or salad meals at home, it was delicious. Demi Baguette from Di Bruno Bros. Among the places I stopped was Papyrus, a stationery store to browse a bit. I also took a bit of break by sitting down on a bench in the lovely park at Rittenhouse Square. I tried to Instagram photos, but the signal wasn't great and my battery was dying, so I did as much as possible. Unable to fit in a visit to a museum, I actually made my way back to the train station slowly. The line to the stairs for the platform was long and again the train was full, this time with a lot of college students returning to school after spring break. My parents both took me to and picked me up from the train station. Even though I was tired, I managed to do my laundry at their place afterwards, so that I could be social on Monday. It was a short trip, so just a taste! I kept thinking that it was so great to be there. I really love it. After about 15 months away, I had seriously missed it. It was a change and nice to spoil myself rotten on this trip too! Hopefully, I will return for a longer and more indulgent daytrip around my birthday next month. I probably selected the last cold day of the season, so it will probably be much nicer when I return. 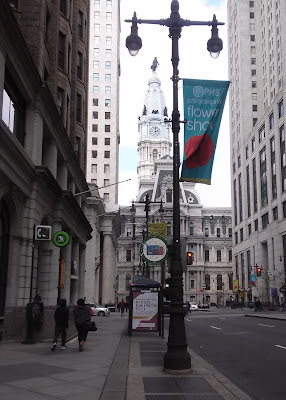 There is so much going on in this city advertised on banners plus I spotted a couple of new places that I would like to check out! I can't wait to go back! I am hosting Easter dinner for my family this year! A small dinner party, there will actually only be five of us including my parents, my maternal grandparents and myself. I normally host one or two guests as often as possible and have had a dinner party for four once. 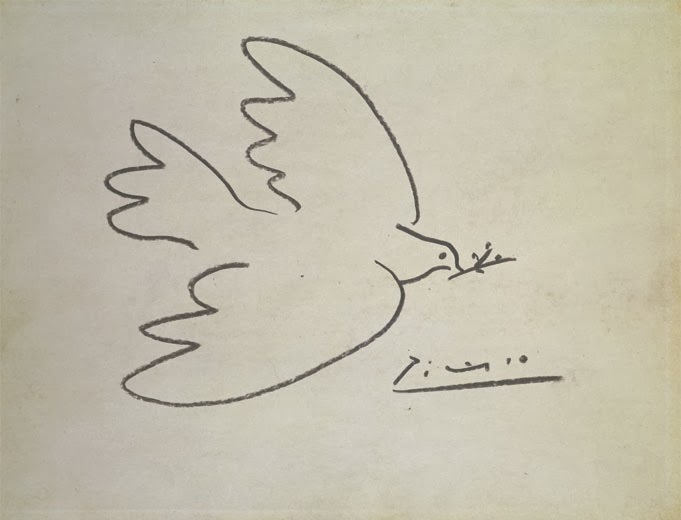 (Read about the preparation and the result.) I'm comfortable as a hostess with one or two guests. Five people total does make me a bit nervous, but in my planning so far, I know it will be successful. My hosting a holiday meal for the family is a first for me. I figured when I'm married and have a bit of a larger home and a better-equipped kitchen, then I would be in the mix for hosting every once in awhile. But not now! Low on inventory, I only have service for four everything, sometimes I only have two of a kind! I don't even have a table big enough nor five matching chairs. 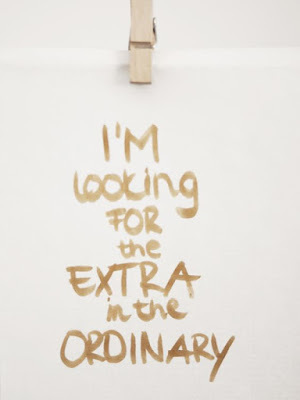 Perfectionist that I am, I want everything to be very nice. Since one of my New Year's Resolutions was to entertain more frequently, I wanted to announce that I was the hostess and explain my preparations so far in this post. I promise to publish a follow up post with pictures of the event including the table settings and the food. Let's start with the menu. I will not be serving a traditional lamb or ham as I have never made them before. Even though I still have a turkey in the freezer and have roasted a bird twice, I decided against that as well. Instead, I will dish up an Italian feast. The main course will be meat lasagna, which has turned out fabulously twice. So delicious! I first followed this recipe from theKitchn on New Year's Eve, so I will blog about it as my final new recipe of that over-a-year-long cooking commitment sometime in the near future. (I need to take pictures.) I happened to make it a second time for a family in need. Both of those times, I served it as soon as I made it. For the holiday, I will be making it ahead of time for the first time. 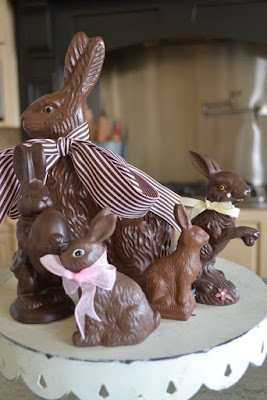 So, I will be assembling it the previous evening, storing in the fridge overnight and sliding it into the oven on Easter Sunday. Since my kitchen is open to my dining room, a make-ahead meal will allow my kitchen to be clean the next morning. My job is usually to serve drinks at my parents' place and it will be no different at mine. I love pitchers, so I have three clear glass ones, a clear plastic one with a white lid, and a large white one for tea. I grew up drinking tea at family dinners. Even now, I make a large pot of tea and keep two pitchers of it in my fridge about twice a week, nearly every week. Mine is decaffeinated. I will make sure I designate a specific pitcher for unsweetened tea, just as my mom always did growing up. I have six medium-sized French cafe water glasses that I could use for the tea. My parents will also have to bring bags of ice as I only a single ice tray. I do have a ice bucket though. I could use a cup to scoop. I could use a little salad plate from my everyday dinnerware for the lemon slices. Of course, I have matching red and white glasses for the bottles of wine that both I and my grandfather will supply. I am not going to decant any wine, just uncork the bottles. I have a large plain clear glass bowl for the salad. I think I will prepare the salad with all those toppings already tossed in. I have a pair of silicone tongs for cooking to serve the salad. I will have an old tomato sauce jar full of my balsamic vinaigrette (which is only olive oil, balsamic vinegar, salt and freshly-ground black pepper). My mom will bring over a few bottles of other salad dressings. My main course is the meat lasagna from scratch. Since my mom does not enjoy spicy food, I will use mild sausage rather than my usual spicy kind. The red and white dish will go from oven to table. I will probably need a couple of trivets or more potholders than I own between the long dish and the table. I have a knife and spatula to serve. For dessert, I will be making the coconut cake that I have written about previously, cutting corners using the boxed cake mix and canned buttercream frosting. Coconut cake is my favorite non-chocolate cake and I love it for Easter. 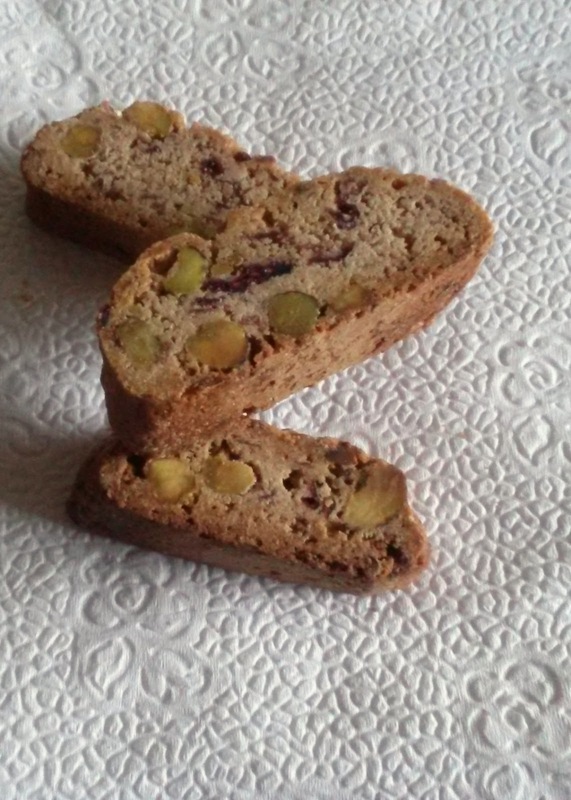 I will serve it on my clear glass cake plate. I already borrowed a clear glass cake dome from my mom. I will ask my mom to bring over a serving spatula that I had given to her. As I want the dinner to be a success, I will make my famous chocolate fudge from scratch. My grandparents love this; this is especially a highlight for my grandmother. It's not my favorite because I don't love it and then when you look how to make it online, there are very specific steps including a candy thermometer, so my way of dumping all the ingredients into a saucepan over heat and then pouring into a piece of Pyrex makes me feel like a fraud! This has to be made at least a couple of days in advance and I try to keep those ingredients in stock, so it won't be a problem. I will cube the fudge on Sunday morning and will stack the pieces in a piece of glassware my mom brings over. I'm thinking I will wash the salad plates and use them as dessert plates. Having bought a multi-pack of five mini gold-foil wrapped Lindt milk chocolate bunnies, I will place one at the center of each salad plate before guests arrive. I am daydreaming of the table settings. 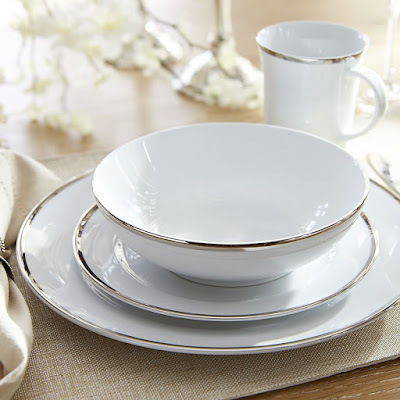 My dinnerware set for everyday (and the only one that I had owned) was service for four. I did some research and couldn't find either a fifth match or a plate close enough for my taste. So, I actually bought five dinner plates and five salad plates. I really wanted my table to look nice! I had been eyeing these particular open stock dishes from Pier 1 for awhile and was toying with the idea of picking up service for two so I could have a fancy set for me and a dinner date. But I had enough money in my checking account, so I ordered these matching Grace plates on sale plus free shipping. With their platinum trim, how elegant and classic are they?! I can hardly wait to see them! The family dinner at Easter usually doubles as my birthday dinner with family. So, this is the dinner where I have more of a say in the menu. It makes sense to me that this is the holiday I'm hosting. What confirmed my decision to host was the fact that it will be much smaller than usual. My brother just got engaged(!) and so we have shared feasts with her large family recently, but they are traveling to spend it with her's. And then my sister has to work. Since Easter is early this year, my mom has already invited me to a separate dinner during the week of my birthday though. Anyway, I predict that my dinner will be successful and gushed about by myself, my mother, and my grandmother for years to come! I am excited for this dinner party and hope that it's the first of many throughout my lifetime! 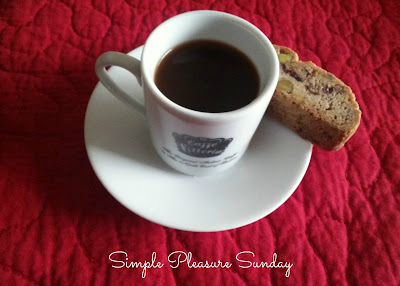 I discovered a new romantic comedy starring Sarah Jessica Parker that is set in Italy in the This & That blog post of recommendations from Shannon of The Simply Luxurious Life on Friday morning. I watched All Roads Lead to Rome on my laptop via Amazon Video Saturday night. 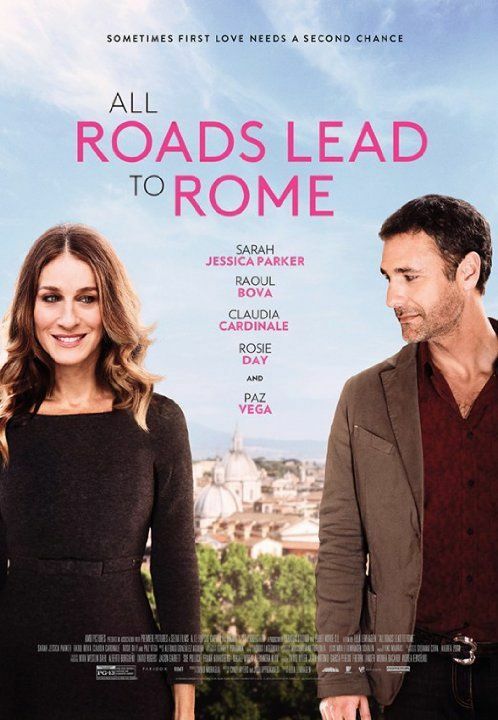 SJP's character takes her teenage daughter on a two-week vacation to Italy, removing her from a troubling situation. Her daughter runs away, desperately trying to get to the airport, taking a woman desperately trying to get to Rome with her. SJP unexpectedly runs into her old Italian boyfriend, who is also the son of the woman. This couple chases the other two, a Roma. I enjoyed watching it. It wasn't the best movie though... Poor reviews to boot. It's just that I truly love romantic comedies. Plus, Sarah Jessica Parker is someone I adore. I also recognized her character's ex-boyfriend from the film Under the Tuscan Sun and he was wonderful eye candy. Also visually pleasing was the Italian scenery, both countryside and city. The story kept my interest and it had a happy ending, but the script was pretty bad. As a result, the chemistry and relationships between the main characters truly suffered. The acting was in place and if the dialogue had been way better, then it would have been a great, although predictable, rom-com. I always see the good in everything and even I kept thinking, oh, come on! And another thing, there is enough spoken Italian to warrant subtitles, but there aren't any. I'm glad I remember some of the language! This is a movie you pay 5 bucks for to watch it once. Shannon was right though, it was a good way to unwind this weekend. See, I was social Wednesday, Thursday, and Friday, learning most of those plans only hours before, so I have had quite a busy week, trying to fit in the things I must do as well. Time spent in Italy is always an ideal escape.